Established in 2003, Rumitek specialise in the manufacture and supply of molasses based liquid supplements for graziers, feed lotters and dairy farmers. For the grazier, Rumitek have both cattle and sheep pasture and feed supplement products available. These feed supplements provide a balance of energy, protein, minerals and vitamins to help utilise pastures and improve the performance of livestock. Pasture is the most economic form of feed for livestock. Good pasture provides around 10-12% protein, 8 -10 MJ/kg of metabolisable energy (ME) and 70-80% digestibility . As pasture quality declines there is resultant decline in feed value. Late season pastures can be as low as 3-4% protein, and 5-6 MJ/kg ME and 30-40% digestability. As the feed value of the pasture declines, there is a resulting decline in voluntary dry matter intake, which results in decreased liveweight gains and ultimately liveweight losses. Before this point is reached, cattle require feed supplements to preserve liveweight and limit further losses. By delivering a source of nitrogen and fermentable energy, Rumitek pasture supplements stimulate the rumen micro organisms to drive dry matter intake up, resulting in increased nutrient intake, and maintenance of liveweight. In cases where Rumitek feed supplements are started before the pasture quality has declined farmers will not only notice a decreased loss of liveweight but an increase in livestock body weight. 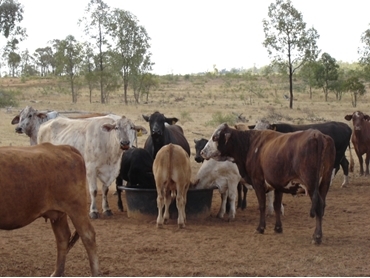 Rumitek feed supplement products can be used for a variety of feeding programs including drought, maintenance, production or crop finishing as well as grain assisting. use of rumen modifiers to better utilise energy and improve feed conversion. Specific cattle feed supplement products from Rumitek include Rumifeed, Vitamol, Vitameal, Maintain Plus, Maintain, and Standard Feedlot. Sheep feed supplements products include Rumi-Allrounder and Rumi Lamb Feedlot. Rumifeed is a full service product and is delivered into the on farm trough. All other products are available in bulk loads or collection from Rumitek resellers.